So, you like French brands. You like SUVs. You like the idea of personalising your car to be unique and to stand out from the crowd. Well, you haven’t really been spoilt for choice — until now. That’s because there are now two models on the Australian market that will tick all of those boxes. 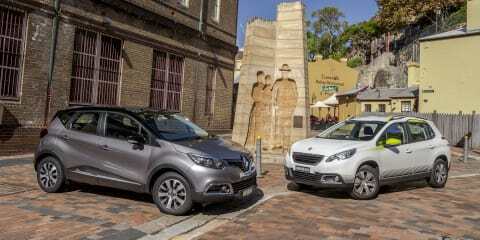 They are the all-new Renault Captur and the recently refreshed Peugeot 2008. The Renault Captur is a new arrival to Australia in the booming small SUV segment, after having launched in Europe nearly 18 months ago – which is about when the first iteration of the Peugeot 2008 came out here. Since its international launch, the Renault has always been about big customisation options, and in Europe the Peugeot has, too – but only recently has it been offered with them here. The models we’re testing here are priced closely to one another. The Renault Captur Expression auto starts at $25,990 plus on-road costs, while the Peugeot 2008 Active auto is priced from $24,990 plus on-roads. Read full pricing and specifications for the Renault Captur. Read full pricing and specifications for the Peugeot 2008. So what better way to find out which is the smarter choice than by pitting these two sticker-clad, snail-eating small SUVs up against one another? Before we go any further, though, let’s talk about those stickers. Like the current trend in skin art, the decals aren’t cheap, either. Peugeot breaks its “Downtown” decal packs down into small sections, though it is expected buyers could get the lot for a discounted fee. The recommended retail price for the decals on the upper section that covers the roof bars and upper edges of the rear doors is $302.27, while the side mirror caps add $320.75 and the lower decal kit is $516.42. The interior also sees a range of accessory items for those who want to add a little more flair in the cabin, with the decal kit covering air vents, front door mouldings, steering wheel, dash visors, centre console and floor mats costing $297.51. That means the total sticker price (geddit?) as seen here is $1438.95. Renault’s personalisation options are similarly pricey. The two-tone metallic paint of our test car (it features a black roof turret) costs a considerable $1800, while the roof decals – in the Paris theme – add a further $600. The interior of the Captur we tested also had the Paris theme going on, with zipper-up seat covers fitted front and rear – at a cost of $600. The good thing about these is that you can take them off and wash them if you need to, or if you get sick of the pattern. On that topic, under the bonnets of these two it’s an apparent case of tried and tested versus new-world thinking. The Peugeot is the former, with a 1.6-litre four-cylinder non-turbo petrol engine that produces 88kW of power at 6000rpm and 160Nm at a high 4250rpm. The engine is teamed to a four-speed automatic. The Renault goes a very different way, with a 1.2-litre four-cylinder turbo engine producing 88kW at 4900rpm and 190Nm at 2000rpm. Changing gears is done via a six-speed electronic dual-clutch automatic. There’s a big difference in fuel consumption, too. Renault claims its little truck will use 5.4 litres per 100 kilometres, while the Peugeot is thirstier, with claimed consumption of 6.5L/100km. But usability is arguably more important than numbers and figures, and that’s where the Pug turns the tables on its French competitor. Yes, the little 1.6-litre and four-speed auto make for an old school combination, but they get the job done competently whether you’re running around town or cruising down the highway. Under hard acceleration the engine in the Peugeot is very noisy, but it is willing enough to keep the lightweight (1113-kilogram), high-rider moving along relatively swiftly. It can be shrill under hard acceleration, too. The Peugeot’s transmission can jar into gears, but it holds them well because there’s a lack of ratios to choose from. There is a sport mode and a snow mode for the transmission, too. It is unashamedly slower than the Renault despite that car being heavier (1215kg), but the fact of the matter in the Peugeot is that you know what’s going to happen when you put your right foot flat. Movement. Progress. Slotting through that gap in the traffic at a T-intersection. You don’t have that comfort in the Renault. That’s in part because of its high-tech transmission, which can easily be caught out. At low speeds, or from a standstill, we found there was an unforgivable amount of lag before the gearbox would allow any progress. It’s also partly down to the small output engine, which doesn’t hit max torque until 2000rpm – about 500rpm too high to make you feel confident you’ll make a gap in traffic. Indeed, we found ourselves a little uncomfortable in the Renault when trying to take off from intersections, and we noted some graunching noises at low speeds upon acceleration. However, once it’s rolling, the Renault’s engine is a peach of a thing. Progress verges on rapid at full throttle, and the gearbox feels like it knows what it’s doing a bit better at speed. In terms of the way each drives, the Peugeot again surprises with its more user-friendly nature. It remains very well composed over big bumps like speedhumps and road joints, but broken road surfaces or sharp-edged potholes can upset the level of comfort in the cabin. We were particularly impressed with the way the suspension dealt with the jittery bumps around town. Around town the Peugeot’s steering is light and city-friendly, and it also handles with more agility than the Renault on the open road. With its tiny steering wheel encouraging the driver to push a little harder than is the case with the oversized tiller in the Renault, the Peugeot manages to feel far more like a hatchback than an SUV in bends. Indeed, there’s less body roll evident and the 2008’s 16-inch wheels with narrowish 195mm, 60-profile Goodyear tyres offer plenty of cornering grip, too. The Renault isn’t disappointing in the way it drives, but it can’t match the levels of involvement on offer in the Peugeot. The ride quality isn’t as settled as the Peugeot over small bumps and lumps, and it wears slightly wider (205mm) 16-inch, 60-profile Bridgestone tyres. It also tends to exaggerate speed hump impacts more – in short, you feel more of the body movement in the Captur. On top of that, the suspension is more audible, too, and there’s more wind noise intrusion into the cabin than in the Peugeot – though the engine is quieter. We noted the brakes in the Renault (disc front, drum rear) were spongier and less responsive to sudden inputs than those found in the Peugeot (discs front and rear), too. Around town the Renault is a cinch to park, with steering that lightens up noticeably. And while both cars have rear parking sensors and a reverse-view camera (which is a big tick to the respective French brands), the Renault’s rising beltline means it’s harder to see out of when you’re performing a reverse-parallel park than the Peugeot. Both camera systems also had little glitches, though. The Renault’s LG media unit takes a good five seconds to initialise after you start the car, which is annoying if you’re in a hurry. The Peugeot’s display was quicker to fire at about 2 seconds, but after shifting from R to D we noticed red text flash over a black screen before the menu showed up again. On the topic of the media screens, each SUV has a 7.0-inch touch-sensitive display unit that offers USB connectivity – the Renault’s at the top of the screen, which means untidy cords could get in the way, while Peugeot has two, mounted cleverly in front of the shifter and with a cubby for your device to sit inside when connected) and Bluetooth phone and audio streaming. The Peugeot’s media screen menu system has been improved over the model we had as a long-term loan car, but it’s still a bit confusing to navigate through. And there’s no satellite navigation, which is standard on the Renault. The menu management system in the Renault is far more simple to use, too, with bright coloured icons making it easier to hit what you need at a glance. Both cars have their quirks in terms of the steering wheel-mounted controls – the Renault has cruise control buttons on the wheel (but a silly separate activation button) and a column-mounted stalk with audio controls. The Peugeot has audio controls on the wheel, but a steering-column stalk for its cruise controls. To be frank, neither solution is ideal. In terms of the rest of the interior presentation and finishes, the Peugeot again stands a head taller than its Renault rival. A swathe of soft-touch plastic across the dashboard, as well as sparkly coloured plastic finishes, aid in making the Pug feel more upmarket than the Renault, which has a hard plastic dashboard that looks made-to-a-price. Indeed, we noted a few sharp edges to the plastics in the Renault, which make the cabin feel cheap and, frankly, a bit immature. That said, the crucial controls all fall easily to hand in the Renault – but as is the case with many French cars, there are no decent cupholders available. Well, the Renault has three (the rearmost of which can double as a stowage bin if the attachment is fitted) though they are all quite small and shallow; the Peugeot has none. Zero. The Peugeot does make up for it with storage highlights such as large door pockets for all doors, and a little covered section between the front seats. There are no map pockets, though, and the glovebox is so tiny as to be considered a novelty. The Renault doesn’t have map pockets, either – well not on the seat covers fitted to our test car, instead there are five elasticised bands that are definitely eye-catching, if not overly practical. That said, it has a clever dash-top storage bin, and a bigger glovebox. In terms of back seat space, these two offer mixed fitment for adults. The Renault, for instance, has better knee room, yet it feels narrower than the Peugeot. The 2008, on the other hand, has exceptional head room, but is tight for knee room and has quite a flat rear seat. Both have two ISOFIX child seat restraints, as well as a trio of top-tether hooks. Boot capacity is decent for both vehicles, and both have temporary spare wheels. The Renault features a dual floor cargo system that spans 377 litres with the false floor in place, or 455L without it. You need to keep the floor in if you want a flat surface when you fold down the 60/40 rear seats, and the capacity increases to 1235L if you do. The Peugeot doesn’t have a dual-floor system, but it does have a 410L boot with five seats up, or 1400L with the 60/40 split-fold seats dropped down. Another question buyers need to consider is airbag protection. Renault’s Captur has dual front and front side airbag protection, but it lacks any rear-seat airbag coverage, unlike the Peugeot, which has curtain airbags to cover rear seat occupants. Despite the lack of rear airbag protection, both the Renault and Peugeot claim the maximum five-star safety rating. Ownership, too, deserves a closer examination. The Renault comes with a five-year, unlimited kilometre warranty, with five years of roadside assistance and five years of capped-price service coverage. Maintenance is due every 12 months or 15,000 kilometres, with an annual average cost of $299 over the first three years. The Peugeot is covered by a three-year/100,000km warranty, and comes with three years of roadside assistance and a capped-price service campaign that spans five years. Servicing is due every 12 months or 15,000km, and the annual average costs are higher for the Peugeot over the coverage period ($495). So you’re more spoilt for choice now than ever if you want a baby French SUV, but there’s only one choice we’d make if it came to picking between these two. The Renault is a welcome entry to the compact SUV segment and it certainly has some likeable attributes. But it falls short this time around. The Peugeot has impressed us in the past, and the few little tweaks the brand has made to it over the time it has been on sale have only added to its appeal. It wins this test, and quite convincingly so.